The PTM 200 is a miniaturized batteryless switch module (40 mm x 40 mm x 11.2 mm) which allows the realization of very slim on-wall mountable rocker switches or remote controls. The actuating force is around 7 N only over a travel of 1.8 mm. 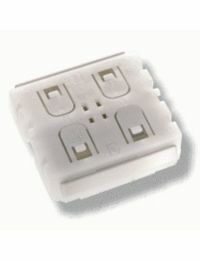 Optionally, one or two switch rockers or up to four push buttons can be realized. This page was last modified on 28 September 2010, at 15:06.